There’s something deeply satisfying about getting a bargain. Grabbing that floaty cardi you’d been eyeing up, now with a hefty discount tag attached to it. Booking a stay at a hotel that would have been out of your price range if it hadn’t had its rates reduced. Fortunately, being a plant-lover and a bargain-hunter is not mutually exclusive! Garden centres are devilish places. They beguile and bewitch and tempt you with plants at the peak of their flowering season. 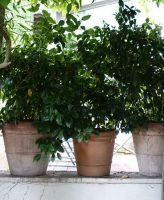 If you pick up one small pot, it sits there forlornly, bereft of its friends and neighbours, in danger of tipping over, without another pot or two to offer support. 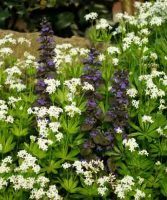 When we first began planting up our garden, my parents dug up from their own garden and donated fast ground-covering plants, like pretty blue campanula, to help cover some of the wilder areas at the top of the garden. These did the trick nicely, romping off to cover up the bare soil and could be cut back whenever we found a choicer specimen to replace it with. Top marks to those easy-going plants which perform spectacularly and never ask for much in return. Here are some more of my favourite low maintenance plants. A stunning, clump-forming perennial, with attractive foliage and sprays of delicate flowers. Tiny, starry, white flowers, opening from pink buds, are produced in late spring, sometimes followed by a second flush in summer. The gorgeous, deeply-lobed leaves are mid-green with maroon markings and provide useful ground cover in woodland conditions. A mass of golden, daisy-like flowerheads are carried on upright stems from late summer to mid-autumn. 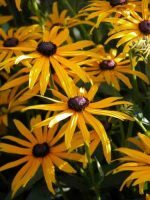 A superb, late-flowering perennial, the cheerful yellow rays surround prominent black-brown, cone-shaped discs. Come spring, I race out into the garden and pit my weeding fork against the clock. I start off with the flower bed nearest the back door and work my way round to the top of the garden… and then start all over again.